Expected to be a tight race for the top spot between Murray State and preseason favorite Morehead State, the Ohio Valley Conference was Murray State’s race to lose from early December. That is when the Racers knocked off Morehead State by 30 points and sent a message. Murray State went on to get off to a 16-0 start before falling to Morehead in the next-to-last game of the season. Morehead finished in second at 15-3, two games back of Murray State. Three teams tied at 11-7, while five teams finished below .500. The Racers struggled in the conference tournament, but knocked off Morehead State in the title game and then upset Vanderbilt in the first round of the NCAA Tournament. They took Butler to the wire in the second round before losing by two. They are the favorite once again in the conference. 1. Murray State: The defending OVC champions were two points from the Sweet Sixteen, and they could get there this season. They are loaded on the perimeter, and have Ivan Aska down low. 2. 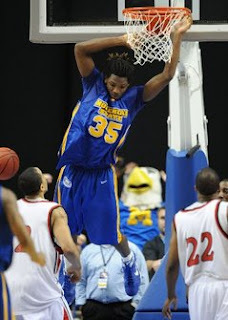 Morehead State: Can Kenneth Faried carry the Racers to the Big Dance? He will have help in the backcourt with all-conference guard Demonte Harper. 3. Eastern Kentucky: Justin Stommes is one of the tougher match-ups in the league, while Joshua Jones and New Orleans transfer Devin McDonald are solid guards. 4. Eastern Illinois: The Panthers won seven straight games to end the regular season last year, and have a very good guard duo in Tyler Laser and Jeremy Granger. 5. Austin Peay: The Governors return four starters from a third-place finish last year, including all-conference forward Anthony Campbell and center John Fraley. 6. Tennessee Tech: Look for the Golden Eagles to improve from last season, due to the return of Kevin Murphy and the addition of Zac Swansey. 7. Southeast Missouri State: The Redhawks finished ninth last season, but they return three starters and bring in JC transfer Marcus Brister at guard. 8. Jacksonville State: The late loss of Trenton Marshall really hurts, but guard Nick Murphy is a very good scorer and rebounder, while Jeremy Bynum is solid. 9. Tennessee State: The inside-outside trio of guards Jacquan Nobles and Will Peters and forward Robert Covington will carry the Tigers this season. 10. Tennessee-Martin: Don’t completely write off the Skyhawks, who won only one OVC game last season. Benzor Simmons is a solid go-to-guy.